Looking for the perfect Preakness experience? You’re on the right track. We’re working hard to ensure the smoothest pickups and dropoffs possible for this year’s races. Here are some helpful tips. 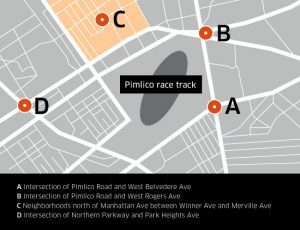 Don’t hoof it to the “mane” exits – Roads and walkways outside of Pimlico will be congested after the race. Avoid requesting in crowded areas, as your driver may not be able to reach you. Say hay to your driver – If you’re unsure whether or not you’re in the right place, don’t hesitate to call your driver and confirm. Be patient – Due to traffic, road closures, and high demand, we anticipate higher than normal ETAs. Please be patient as your driver works to get to you. Pay attention to your suggested pick-up spot – We’ve selected some suggested pickup zones for you to use. Head to one of these points before requesting so that your driver can reach you. At events like the Preakness, high demand can result in higher fares. You’ll always be notified if dynamic pricing comes into effect. You can also use the Fare Estimate option in the Uber app to estimate your fare.